Get Your Green On with a St. Patrick's Day Party! This entry was posted on March 9, 2017 by Jessica Anderson. Next Friday March 17th is St. Patrick’s Day, the luckiest day of the year! Get your green on and celebrate this Irish holiday with friends, family or co-workers. With spring just around the corner, St. Patrick's Day is the perfect excuse to throw a party celebrating the changing season! Everyone's Irish on March 17th! Below are some ideas to make your party extra-festive! Decorations: Go Green for your St. Patrick's Day décor! Shamrock and leprechauns make the obvious choice, or create a spring themed decor with flowers such as Irish Bells, Calla Lilies, or clover. Spring Topiaries of green and white make beautiful centerpieces, or create an Irish Fairy garden complete with a rainbow and pot of gold! Celtic Music: Create a playlist of favorite Irish songs. While I was in college, my favorite hang out was an Irish pub called Kell’s. Live music staples included sing-along drinking songs, such as The Rattlin’ Bog and Molly Malone (Cockles & Mussels) . Check out these renditions to get in a Celtic mood! Or try Pandora's "St. Patrick's Day Radio" for more Gaelic tunes! Irish-Inspired Eats: Create an Irish menu. Hardy fare includes Corn Beef and Cabbage, Sheppards Pie, Irish Stew and Soda Bread. Find great recipes to try at Allrecipes.com. For dessert, shamrock shaped sugar cookies, Lucky Charms treats, or Green leprechaun cake pops will be hits at your party! Drinks: Green beer and Guinness are always St. Patrick's Day favorites. Or create boozy shamrock shakes, pot of gold shots, or Irish coffee drinks. 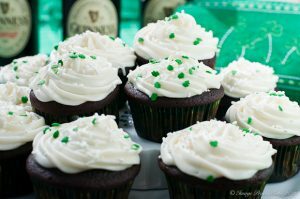 Check out Celebration's recipes for great spiked St. Pat's Day drinks! Or drink the "water of life"....WHISKEY! For the best Irish Whiskeys for your buck, check out this article by Men's Health. You can even serve it in your own monogrammed glasses. -Host a "wear green to work" contest at the office. -To start the green beer flowing, host a rousing game of Beer Pong! - Get Lucky with Irish-themed Bingo! Find bingo game cards here. The perfect trophy for any St. Pat's Day contest! 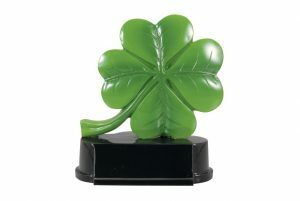 Awards: Add hype to the competition with a personalized St. Patrick's Day Trophy! -At the end of the rainbow, guarded by a greedy Leprechaun, is always a Pot of Gold!! We offer two trophies, the Pot of Gold Resin Award and the Perpetual Pot of Gold Resin Trophy. -The luckiest award we offer is the Four Leaf Clover Resin Award. -Create your own design on one of our versatile green plaques! We offer two styles Green Woodgrain and Emerald Sublimated. Check out all of our St. Patrick's Day Awards here. We also have many more pins and ideas on our St. Patrick's Day Pinterest Page! 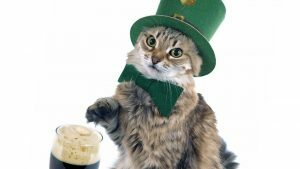 St. Patrick's Day is one of my favorite holidays because I have ancestors from Ireland; I will be sure to don my green to celebrate! And remember, everyone's Irish on March 17th!